When confronted with the question “Would you eat insects?” the average student shudders in disgust, memories of bush tucker trials flashing through their head. Indeed, most people in the West are reluctant to stray far from the pork, beef and chicken we are accustomed to – treating less conventional protein sources with disgust. However, why should this be the case? The custom of entomophagy or consuming insects is well established in other areas of the globe and in many cases insects are considered a rare treat to a mostly meat free diet. When considering if our modern western diets could incorporate this new potential food source or merely continue to reject them, I would argue that, given our current state of protein production, we may soon be forced to do so. The debate and surrounding literature considering livestock rearing to satiate our craving for meat is far too large to cover in this article, however, the basic consensus is that the current scenario is unsustainable and so an alternative is rapidly required. The contributing factors to this argument can loosely be split into 3 main areas: the vast land area required to raise the billions of cows, pigs and chickens required each year (consequently, the single largest factor contributing to deforestation is the beef industry); the resulting greenhouse emissions from these animals-many of which contain methanogenic archaea within their digestive systems (with a single cow producing well over 100 litres of methane a day); and the resource use resulting from the inefficiency of production. It takes around 2Kg of fishmeal to produce 1Kg of the commonly raised species of fish in aquaculture. Consequently, it must be asked if insects could provide an alternative, more sustainable, scenario? This could well be the case given the small size and fast growth rate of insects, making them a suitable candidate for industrial agriculture. 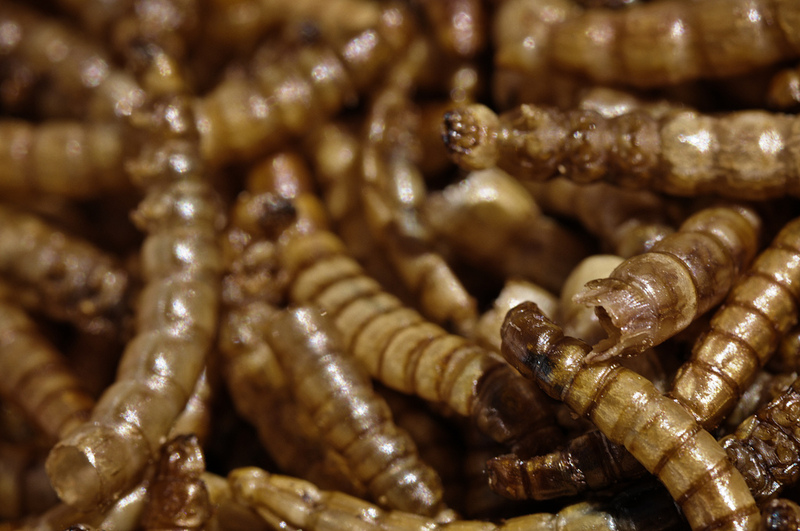 For instance, mealworms (Tenebrio molitor) production requires 13 times less space than an equivalent beef farm. Moreover, they directly produce far less greenhouse gases, for example the house cricket (Acheta domesticus) produces a mere 1/120th of the CO2 of cattle and can often be raised on domestic or agricultural waste. However, not everything is so positive, due to the poikilothermic nature of insects, they are fairly energy intensive to raise in temperate climates as they require constant heating. An important point to note is that insects have not currently been placed under intense artificial selection for traits such as increased growth rates that modern livestock are subject to, therefore it is possible that growth rates of farmed insects could dramatically increase in future. Considering these factors, it would seem that entomophagy could provide a much more sustainable scenario of protein production if we are willing to accept it. However, this idea is still in need of serious debate with regards to many areas such as the welfare of raised insects, disease control when raising organisms that cannot be vaccinated, potential health concerns of an insect based diet and whether or not this would be necessary if meat consumption was simply reduced. With the pressing urge to increase the sustainability of agriculture, this debate cannot be avoided for much longer.